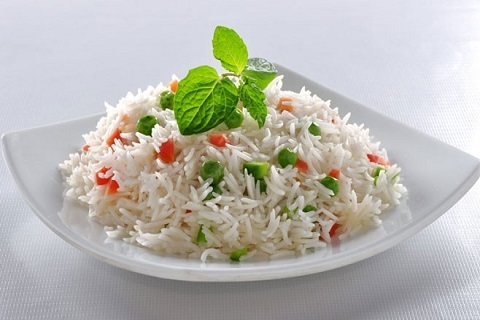 Pilau is beautifully fragrant rice or a combination of rice and meat, poultry, fish or vegetables. It is always cooked in pure butter, fat ghee, but unsalted butter is also a good substitute. Using a spoon of butter lightly fry the sultanas and flaked almonds and keep it aside for garnishing. In a deep pan place the oil, ghee or butter. When hot add the cloves of garlic, cloves, cardamom, cinnamon and peppercorns and sliced onion. When the onion is translucent, add turmeric, the washed and drained rice and the measured amount of water. Cover and cook until all the water is absorbed. When the rice is cooked and the dry, switch off the stove. Allow it to remain till it is cooled a little. In a serving dish arrange the rice and then garnish it with curry leaves, coriander leaves and fried almonds and sultanas. It is ready to be served.